Long time ago, the cat was a common instrument of punishment. It was applied on the bare back of its victim. Various sizes and styles existed. Today, only a few survived. 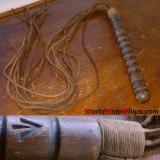 This one has a 1ft turned wooden handle with nine thin leather tails (3ft), fastened by a hemp whipping. It is leightweight and can be swung in a bullwhip-like motion. The tails are not knotted or weighted, so this cat was a quite "humane" one, causing no injuries except some bruising. Note the arrow symbol on the handle, stating that this cat was made for the penal system.